But boy’s room design ideas? When I was expecting my son, I searched high and low for design inspiration for his nursery (you can see how his nursery turned out right here). 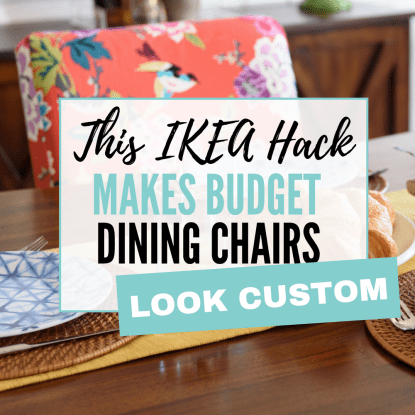 And sure, Pinterest and Google gave me a few ideas, but everything I came across was either too themed, too neutral (You all know I LOVE some colorful decor! ), or simply not my style. Now as we’ve transitioned M to a big boy bed and are changing his room over from a nursery to a true kid’s room (someone pass the tissues, please), I’m finding myself back in that same situation. The good news for you? 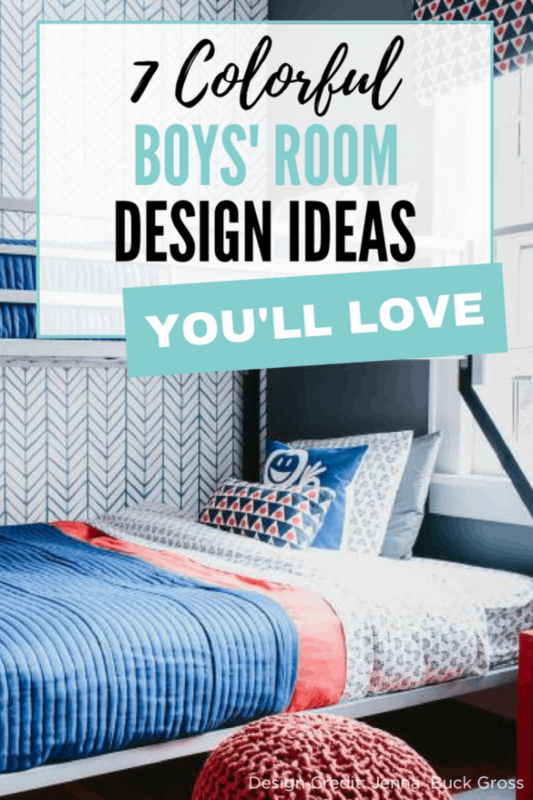 Because I’ve spent a ton of time looking for boy’s room design ideas, YOU don’t have to! Because I’ve got some great, colorful inspiration for you right here. 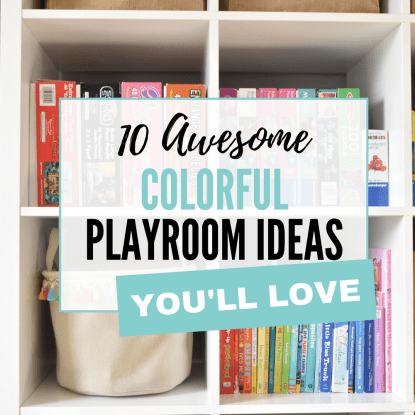 So for all you frustrated boy mamas out there who are looking for colorful decorating inspo for your little dude’s bedroom….it’s your lucky day. 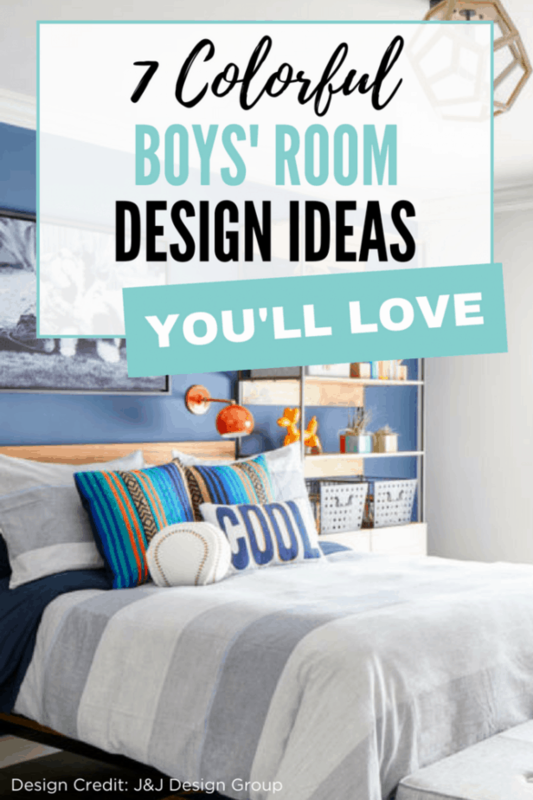 I’ve rounded up 7 colorful boy’s room ideas that I think you’ll love. 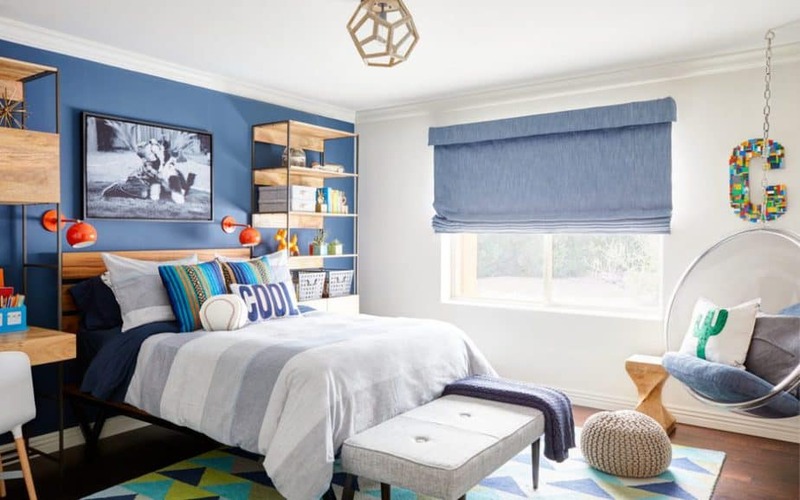 From bright and bold superheroes to an explorer’s paradise, these rooms will totally get your creative decorating ideas flowing. Take a look at the fun boys’ rooms below, and tell me which one’s your favorite by leaving a comment at the end of this post! This post contains affiliate links, which means that if you purchase something by clicking on one of my links I’ll make a small commission at no additional cost to you. Thanks for your support! I love that this room packs a colorful, playful punch without being too committed to a single theme. The bold, graphic rug and that adorable hanging swing….perfection. J&J Design Group knocked this one outta the park, per usual. How fun is this colorful spot, designed by Lizzie of Emmerson & Fifteenth? 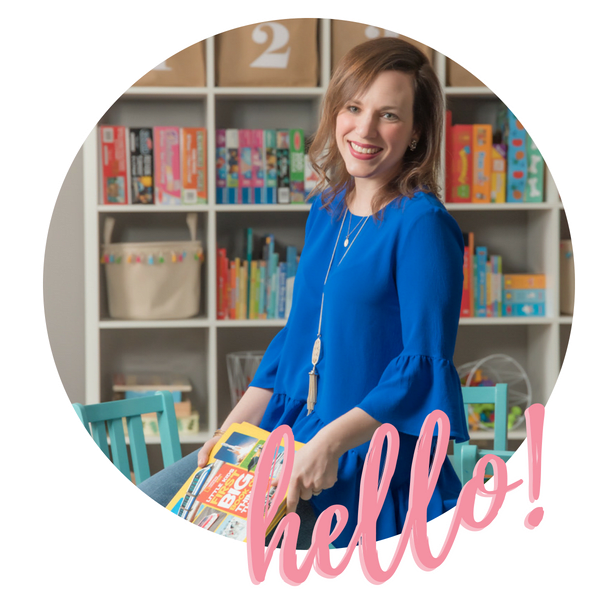 I’m loving the pops of bold hues against a white backdrop, and I can also appreciate Lizzie’s clever storage solutions (like the wall-mounted shelving above the bed) to store alllllllll the kid things. 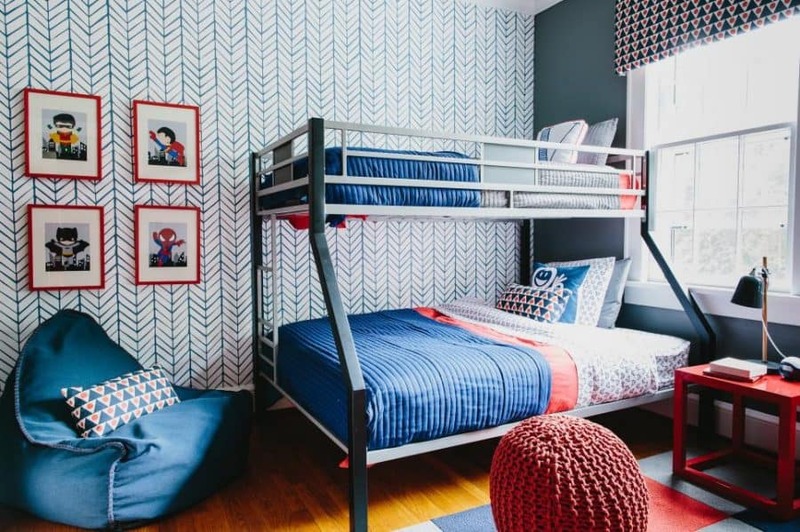 This shared boys’ bedroom is chock full of color and pattern….which is right up my alley! The blue and red color palette is so versatile and can grow with the boys (and that classic, feather wallpaper is always a fan favorite). And when they’re tired of superheroes or other characters of the moment, most of the decor in this space can easily evolve with their tastes. 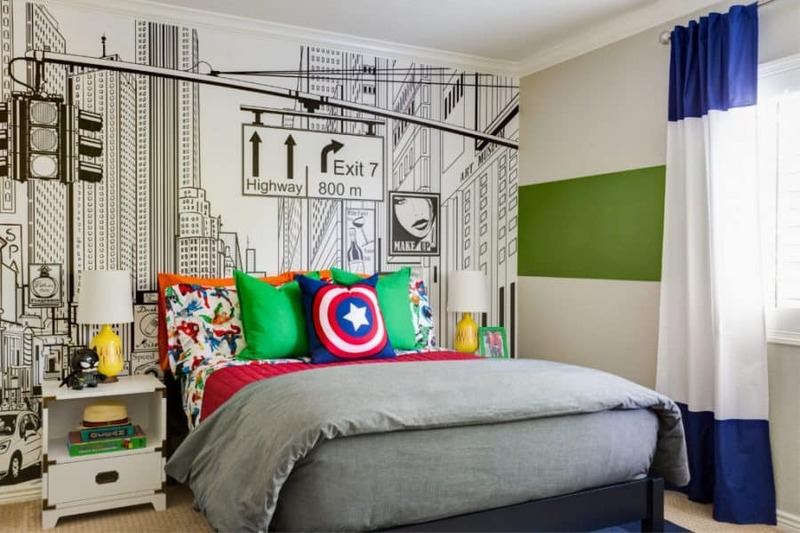 If you have a superhero-loving kiddo, then this room needs to be your go-to design inspiration (LOVE those fun sheets, which are part of this Justice League collection). The black and white cityscape wallpaper is the perfect backdrop for the other bold elements. And if you think the bedroom is great, you need to check out the adjoining bathroom (via the link above), also done in a superhero theme. J&J does it again, guys! SO GOOD. 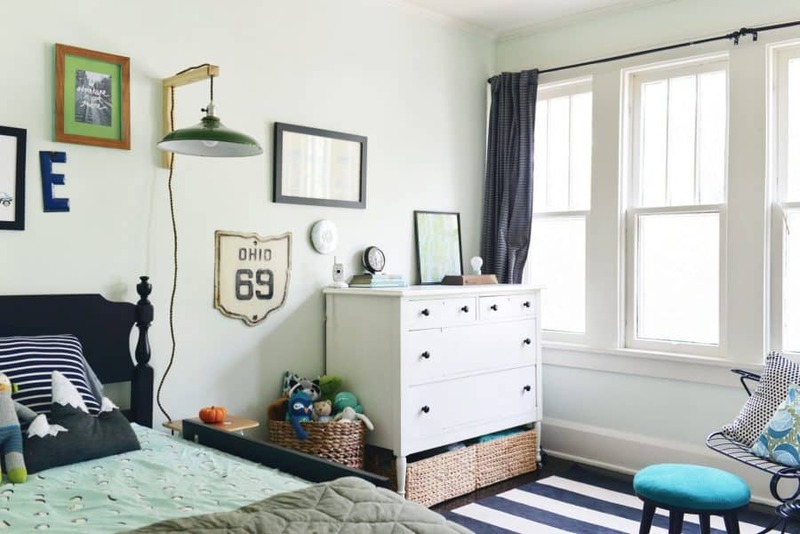 Most woodland-inspired kids’ rooms I’ve come across are pretty neutral, so it’s refreshing to find one that’s as adorable and colorful as the one Erin Marshall designed for her son. The wallpaper totally makes the space, and I love how she’s managed to keep with the overall theme while tastefully incorporating other things (like superheroes!) that her little guy loves. 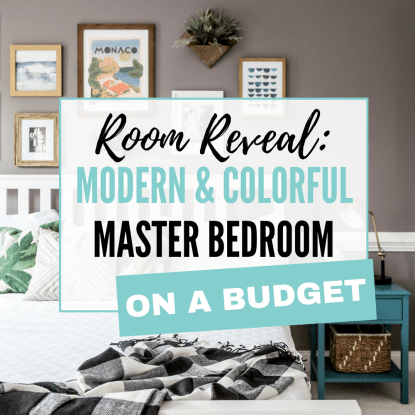 This colorful, vintage-inspired bedroom from Chelsea at Farm Fresh Therapy is precious. I love that the result is fun, polished, yet still has an old school, vintage vibe. 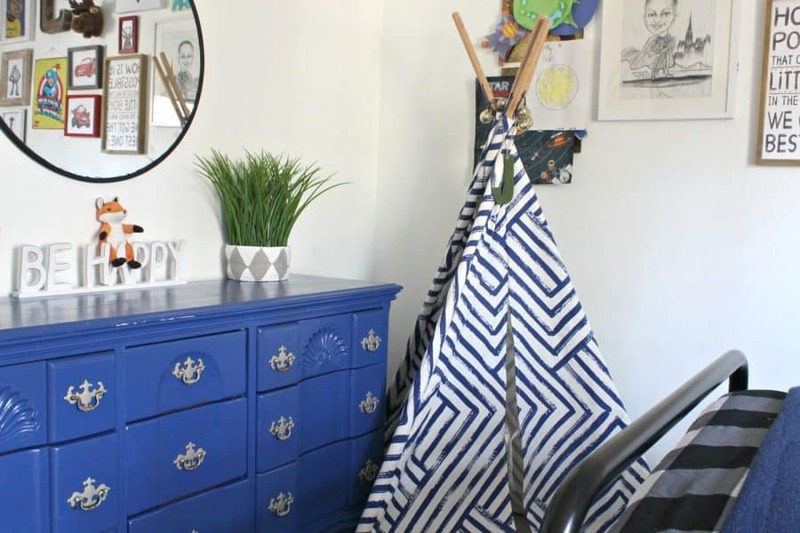 By choosing neutral-colored items for the larger pieces in her son’s room, she punched up the rest of the space by adding in colorful decor and funky accessories. 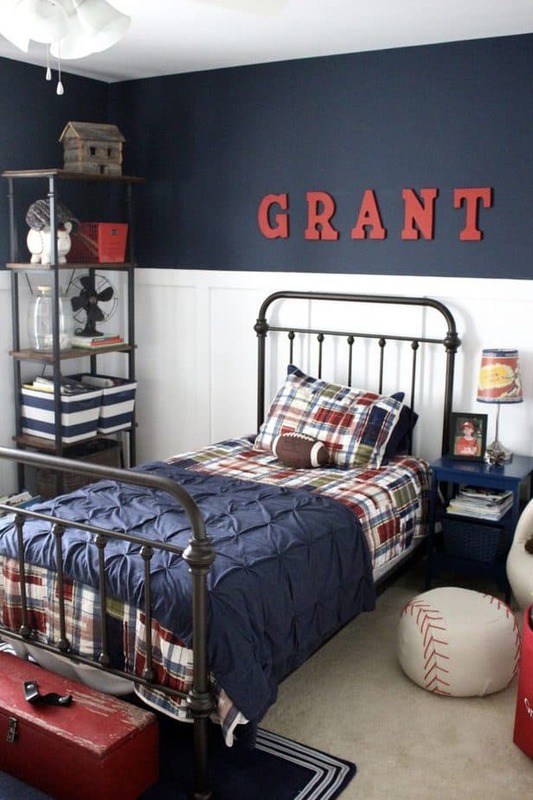 This colorful, sports-themed bedroom is too cute. 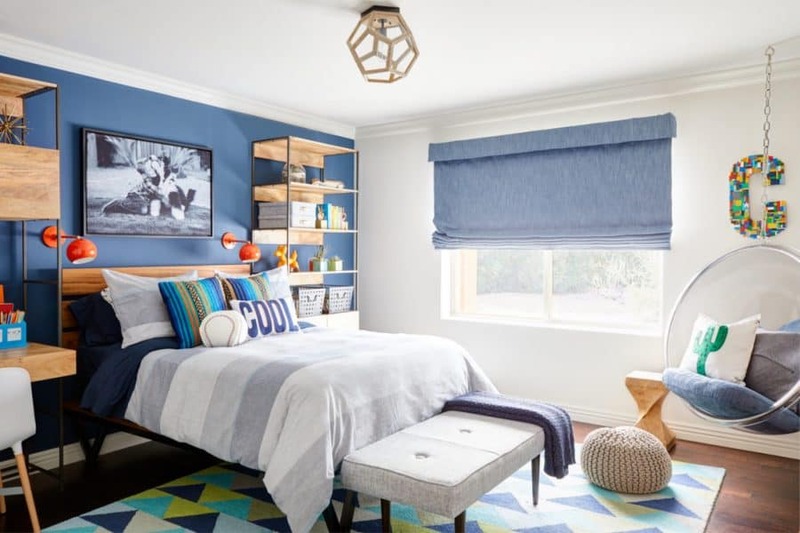 I love that Amy started her design with a colorful, traditional pattern that can grow with her son: the madras bedding (I have a similar madras print in M’s room, which you can find right here). 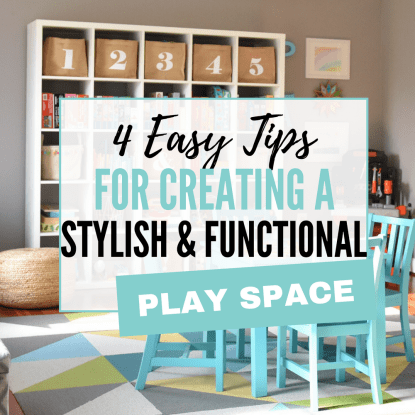 From there, she designed the rest of the room around that happy color scheme, adding in some sporting elements to please her little guy. There you have it! Which room is your favorite? Tell me below! I love the last one and the wall in the blue and red room! Is it bad when I saw the hanging shelves over the bed I thought “accident waiting to happen”? I’m all for floating shelves though, I need to get some more of them. Redoing Andew’s room next week while he’s away at camp and I love the first one. Any idea where the shelving that flanks both sides of the bed are from? Hi Amy! I’m not sure of the exact source for the shelves, but here are a few affiliate links to similar options. There’s a version from Overstock (http://bit.ly/2LRcdHj) and another from Amazon (http://bit.ly/2v7pj9X) that might work for you. 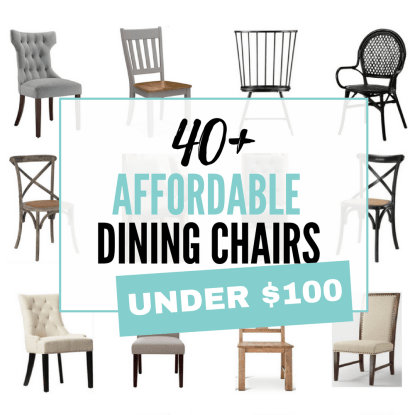 I also like Crate & Barrel’s Beclkett series, although it’s more expensive (http://bit.ly/2NYzfJS). Can’t wait to see what do you with his space!